Most lifters know they should do abdominal work, but many neglect the chore. Often when lifters do add abdominal exercises to their routine, they fail to promote strength to the fullest potential. High rep situps and leg raises are an endurance exercise. I recall getting sore in the hips and legs from the movement before I was able to feel the benefit in the abdominals. I thought, "Why do an exercise that won't help improve the lifts?" For years I did abdominal situps, leg raises and other midsection exercises; generally at the end of a workout session if I didn't leave them out of my routine altogether. I found that holding a 45 pound weight plate on the chest while doing abdominal situps helped take some of the monotony out of the high rep sets. I personally feel that high repetitions in abdominal exercises offer minimal strength gains in terms of lifting. I have found success in increasing abdominal strength by doing heavy movements for lower repetitions. I recommend this type of workout to lifters who already have a conditioned abdominal area. If no or little abdominal work has been done, higher repetitions should be done for several weeks. This will help to prepare for the following heavy resistance abdominal training routine. All areas of the abdominals or trunk muscles should be exercised including sides, lower abs, and upper abs. My routine works all these areas. For a beginners abdominal conditioning program, I recommend bar twists with a pole or broom handle, dumbell side bends, bent knee situps, lying leg raises and crunches; all done with little or no resistance. Once it becomes routine to do these for two to three sets of 15-25 repetitions, you're ready for abdominal strength training. When I first began doing barbell roman chair situps, I used a 95 pound Olympic barbell for 3 or 4 sets of 10 to 12 repetitions. Depending on the individual, most lifters can begin with 45 to 95 pounds. Again, this is following the conditioning phase of abdominal training mentioned. Over a period of time my newfound abdominal exercise has enabled me to improve to using a 315 pound barbell for 3 sets of 10 to 12 repetitions. The increased abdominal strength that I have gained has helped my powerlifts considerably in the last year. The barbell roman chair lift should be done in a slow, controlled manner concentrating on keeping the abs contracted throughout the movement. Like the regular roman chair situp, the movement should be done going only 3/4 of the way down. This will keep a good workload on the abdominals and minimize using the lower back. In time, spotters may be required to perform the exercise safely. Many roman chair situp benches may need extra support to keep the board from falling backward or breaking. The photograph above demonstrates a system to facilitate the movement. Note, the barbell is placed on two car jack stands at a convenient height. An extra wood support under the bench keeps the seat from flexing. Pipe insulation is cut longways and taped to the bar to provide padding for the bicep and forearm. Towels can also be wrapped around the bar if extra padding is needed. Some bars may not require padding depending on the weight used and the sharpness of the knurling. If padding is not available, knee wraps can be wrapped loosely around the elbow covering the forearm and bicep. In addition to the barbell roman chair situps, other abdominal strength movements can be done as well. Holding a plate behind the head on the roman chair can be very effective; however, only light weight can be handled due to poor leverage. Alternating repetitions form opposite elbow to knee holding the plate will work the obliques well. To concentrate on the lower abdominals, hanging leg raises are excellent. These can be done by grasping a chin bar or hanging from a special type of harness. Extra weight can be added to this exercise by converting an Olympic lifting belt into a leg weight belt. This is done by cutting the belt to a 2 inch width, making sure that the holes are still in the center with the buckle still intact. Extra holes may need to be drilled in order to take out extra slack when tightening the belt. The 2 inch belt can be woven through the center of Olympic plates with a loop for the foot on one side and the buckle on the other allowing the weight to be secured between the feet. Foam rubber or knee wraps may help pad between the shin and weight. If doing weighted leg raises by grasping a chin bar, lifting straps are helpful for the grip. As with the barbell roman chair lift, weighted leg raises will increase abdominal strength. I'm convinced that the above exercises have helped me improve strength and prevent lifting related injury. Some of these abdominal movements have helped other lifters as well. If strength training for the abdominals is part of your routine, positive results will be sure to come. Regardless of how much weight one is able to use to strengthen the abdominals, they are an important muscle group which should not be neglected. Not only will a stronger abdominal area help the lifts, it will help make the lower back less susceptible to injury. Many people with extra weight in the abdominal area suffer from lower back pain due to weak abdominal muscles. This type of back problem will only be amplified if the out of shape abs belong to a lifter, due to additional stress on the back from a lift. Do you remember drawings of statues showing a Herculean man who stands with his feet braced, body leaning slightly forward, a huge globe resting upon his shoulders? This figure has been used a great deal in advertisements in recent years to denote the strength or substantiality of the organization which selects this figure as its trademark. I’m referring to the figure of Atlas holding the world upon his shoulders. The story of ancient mythology relates the manner in which the world come to rest upon the shoulders of Atlas. It was originally the work of Hercules to hold up the world; so goes the ancient tale. Atlas should have shared in the labor, but he sought to have Hercules support the world permanently. Hercules, however, had ideas of his own. The story does not tell us that he became fatigued with the work, but id does inform us that he tired of the confining labor, and desired to wander farther about the universe in search of other worlds to conquer. He was reluctant to see others go about their pursuits of pleasure while he had to be constantly at work. So he did a great deal of thinking. He planned a way to get out from under. He told Atlas that, since he must hold up the world forever, he would appreciate it if he (Atlas) would support it for a short time while he adjusted his lion skin and his pads for a long session of work that he had before him. No doubt this shifting of the world back and forth caused the ancients to believe that there was an earthquake of great severity in some part of their world. Atlas was slow-thinking and it never occurred to him that Hercules might relegate the task of holding up the world to him when once he got out from under. With his shoulders once more free, Hercules sauntered off, leaving the fuming and indignant Atlas tied down to the laborious and boring task of supporting the entire world upon his shoulders. If we are to judge by the paintings and statues the ancient artists have bequeathed us which illustrate the physical development of these two famous gentlemen, Atlas and Hercules, there is little doubt that either of them could carry the burden that was placed upon him. Every ancient statue it has been my pleasure to see emphasized size and depth of chest. There were broad shoulders too, but the size and breadth of the chest were especially evident. Throughout the ages it has been known that men with the deepest chests are the strongest, most enduring, healthiest, and usually live the longest. Few people fully realize the importance of depth of chest. The rapid development of the chest which is realized by all bodybuilders who launch upon a regular course of heavy, progressive training is most encouraging. The chests of most persons have long existed in inactivity; poor posture has compressed them rather than given this important part of the body an opportunity to grow; the lungs have been compressed and restricted in their action, and when the chest is raised, the shoulders held back, when the almost dormant muscles of the chest region are stirred up and brought into play by proper exercise, an inevitable result follows. Newer and better blood-circulating avenues are opened, the cells are exhilarated and rejuvenated, they are expanded and the muscular tissue increases in size and weight. There is a great deal to write about the chest. It is one of the most important parts of the body, encasing as it does so many of the vital organs on which our very lives depend. Before going father I would like to present a question. Do you know just what the chest is? At first thought you may say, “That’s a bit ridiculous; why, it’s right here,” tapping the upper part of the chest in the vicinity of the breast-bone, the portion covering the lungs. This is not quite the right answer, for it is too general, not sufficiently specific, and to provide a good definition of anything it must be concise and specific. The chest is that part of the body which covers the lungs, the region under the armpits as well as the part connected with the shoulder blades. The chest is all of these parts harmoniously assembled. By searching for the definition of the word chest in a dictionary we find that the correct answer is a box. And a box, as everyone knows, is composed of four sides, as well as a top and bottom. Considered anatomically the human chest is that portion of the body comprising the breastbone and the ribs on the front, the ribs on the two sides and the shoulder blades forming the rear. The backbone is also a very important part of the rib box. All the parts just mentioned form the framework. The framework is covered with muscle, covered with some of the most important (both from the standpoint of health and appearance) muscles of the entire system. These muscles are woefully weak and neglected in the bodies of the vast majority of human beings. While the limbs of all persons obtain some exercise in going about the daily tasks of living, the muscles of the chest and abdominal regions are too often neglected. The muscles of the outside of the chest can plainly be seen and are well known to bodybuilders but there are many equally important but little known muscles of the chest which are under the surface. These work in conjunction with the rib box to protect, assist in their function and hold in their place the important organs of the chest region. When the muscles on the outside of the body are neglected, the internal muscles also find themselves in a weakened state after long years of little use. Millions of years ago when every living thing upon this earth traveled on all fours, or at least with the backbone more or less parallel with the ground, the organs were suspended form the spinal column not unlike clothes are hung from a line. Finally some of these animals, which through the process of evolution, so geologists and biologists have informed us, became men, stood up. Then to prevent the organs from piling up on each other just would the clothes on a line if you held it in a vertical position instead of a horizontal, muscular attachments were developed to hold the organs in their intended place and to assist them in performing their highly important functions. Reasonable exercise, or other forms of at least fairly vigorous physical activity, strengthens these muscles so that they permit the organs to remain in place and function properly. Weakness in the muscles on the outside of the body coincides with weakness of the internal organs. When a person neglects himself completely, many of the organs slip down and add to the protruding abdomens which are a part of so many persons. Fat-encased organs are sluggish, can only partially perform their functions, while those of the man or woman who maintains proper posture and has sufficient internal strength to hold the organs in their proper places enjoy a brand of health unknown to most humans. It must be evident to you who read this that if the muscles controlling, hoarding and covering these organs are not healthy, are not strong and vigorous, the organs lying beneath are very likely to be in a similar condition. And it is just as evident that if the muscles controlling, guarding and covering these various parts of nature’s human mechanism are healthy, strong and vigorous, then the various internal parts must likewise be in the same robust, efficient condition. Therefore the individual who desires to possess real health, superhealth, not just able-to-be-around health, should develop the muscles of the chest, not just one or two – those which can be seen best when exercising in front of the mirror – but all of them, for in so doing he will also develop all the internal organs contained in the chest or rib box. There are many good chest-developing exercises, scores of which will be offered in chapters to come. The more vigorous of these exercises bring best and quickest results. While it’s beneficial to walk over to an open window and take a few deep breaths, or to take deep breaths any time of the day you may think of it, it is not to be expected that such deep breathing will create appreciable chest growth. The deep breathing will make you feel better, sort of brush the cobwebs from your brain, for the same blood which serves your big toe and every other part of your body also supplies the brain. All of this blood every few moments passes through the heart and lungs, and the deep breathing will cause the blood stream to be more bountifully impregnated with necessary, vitalizing life-maintaining oxygen, which in turn provides a feeling of exhilaration. Deep breathing is a good thing at any time, for most of us are very shallow breathers, utilizing, while the body is in repose, only about one-thirtieth of the actual capacity of our chests, only a fraction of the amount of air from which the chest can extract the oxygen it requires to keep the muscles working. It is evident from this brief description and repetition of this all-important physical development truth, which is bound to appear at times owing to its maximum importance, that you cannot expect much if any progress in developing the lungs – thus increasing the size of the rib box – through free hand exercises or just through breathing, without some form of exercise severe enough to demand a great deal more oxygen to continue the greater effort expended. Effort which greatly increases the body’s need for oxygen is required when chest-building progress is made. Few of us realize how little we use our lungs, how much of the space within the lungs is unused. It remains in idleness as a dark, warm place where cold germs or even more serious disease germs can rapidly multiply because they have ideal conditions for their germination, warmth, moisture and undisturbed quiet. It is good for all of us to breathe deeply at times, draw the fresh air into the lowest depths of the lungs, the innermost cavities, the most remote recesses, filling every tiny cubic millimeter with fresh air. This enforced breathing is a good way to prevent colds. The divers of the South Sea Islands develop a great depth of chest. It is their work to swim far below the surface of the water to gather the pearl-bearing oysters. The better divers stay under the water for at least three minutes, undergoing considerable exertion every moment they are under the surface. Therefore they must develop great lung capacity to follow their vocations. Unless practiced regularly and from early, diving and underwater swimming are not a beneficial means of developing the chest, for the continued exertion, with insufficient quantities of oxygen for the body’s needs, entails considerable strain upon the heart. When under the water for a considerable period the supply of oxygen is depleted, exertion continues, the heart labors faster and faster and harder and harder, in order to supply the crying need for oxygen. Finally a condition is created similar to the pounding of a motorboat when the propeller shaft breaks or is momentarily out of the water. Some years ago I enjoyed underwater swimming. I would swim around for an hour or so, coming up for air when necessary and immediately going under again. I entered an underwater swimming contest and, to win, traversed a distance of 123 feet, across a 90 foot pool, and part way back. I continued for 22 strokes after I thought I must come up for air. And my good old heart rattled and thumped alarmingly for many minutes after that exertion. Great exertion causes unusual effort on the part of the lungs. So much more oxygen is required by the body when it is working hard and long and it is the work of the lungs to extract the needed oxygen from the air and the task of the blood to carry it to the working muscles. There the oxygen unites with glycogen (blood sugar) and forms the combustion or energy which makes it possible for the muscle involved in the action to continue at the task which has been set for it. If you were to start out running rapidly, in a short time (or a longer time if you are in training) you would experience a feeling of breathlessness. The breathlessness might result in unusual fatigue, a cramp or pain in the chest. But if you persisted, training with moderation each day, you would find that the parts of the body adjusted themselves in such a manner that you could run without unusual fatigue or discomfort for many miles; that is, if you were training to be a distance runner. This ability to keep going for a long period, to run mile after mile, is what we calla endurance. It is accustoming the muscles, but most of all the internal processes – the heart and lungs – to carry on the work they are asked to do, for long periods. The feeling of breathlessness or fatigue comes about, first, because the blood cannot supply enough oxygen to the working muscle. An oxygen debt piles up; deposits of lactic acid form in the muscles, which cannot be dissipated until the supply of oxygen adjusts itself to the requirements of the body. Fatigue poisons can cause death; in fact they create a condition in the muscles, usually temporarily, like death. The difference is that in life the lungs, heart and other organs are working desperately to normalize the condition they have encountered, and if you are in good condition the internal organs will eventually catch up to the increased output of glycogen and oxygen demanded of them; they will finally be in balance with that of the muscles. Most of you are acquainted with the phenomenon called “second wind.” This if renewed energy which comes about when a balance between the output of the internal organs and the output of the muscles is attained. Horses have frequently been driven or ridden at high speed for many miles, to the point of complete exhaustion, the exertion continuing to be so tremendous that there is a greater and greater oxygen debt, no chance for the heart and lungs to catch up, so that poisoning actually takes place and they drop dead. Most of you have heard of the ancient runner who ran the first Marathon race. The Greeks had met the Persians at the field of Marathon, twenty-six miles from Athens. The actual distance traversed by this ancient soldier ultimately became the regulation Marathon distance. The soldier who made the first Marathon fun famous had fought all day, then when the tide turned and his side had won victory, dispersing and pursuing the Persians, he was given the task of running to Athens to notify the worried people of the great victory and the future safety of their country. After fighting all day and running twenty-six miles, he dropped dead just as he shouted, “Victory id ours.” He thus gained immortality, but he also proved that the human body or the animal body can be driven to the point of complete exhaustion, or even death, by too long continued unusual exertion. The condition which killed the Greek soldier was an extreme case of fatigue poisoning. Most moderns are so situated that we can stop to rest long before we experience serious ill effects from overexertion. To develop a real chest, both powerful and sizeable, real demands must be made. A condition of breathlessness must be created. In our form of physical training this is best attained by practicing any exercise which brings into play vigorous action of all the muscles of the body, particularly the largest muscles, those farthest from the heart, such as the legs. It is impossible to create breathlessness through arm exercises alone. But the legs when exercised vigorously can create an oxygen debt which is manifested by extreme breathlessness. After the exercise which causes the breathlessness is the best time to practice breathing exercises. In all of the York courses, a breathing exercise, some form of pullover with barbell or dumbbells while lying upon the floor, bench or boxes, is listed as the exercise next after some form of leg-developing movement. When you really need oxygen, you can breathe so hard that the ribs will actually separate and you may experience growing pains for some weeks to come. But don’t let this worry you; in a moderate length of time you will be rewarded by a larger chest and a much healthier internal condition. I recently received a letter from a young man who said that he had received his first copy of Strength and Health magazine a short while before. He also sent for and carefully read my booklet, “The Road to Super Strength,” which shows a number of before and after cases, great improvement through weight-training methods, and also depicts many of the champions that York methods have built. He said that the book was very well written, whoever wrote it knew his business, but he did not believe he could the results in developing his chest that he wanted, through exercise alone. 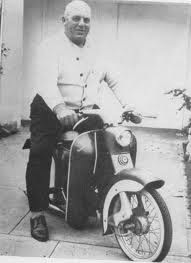 He believed he could get the best results after he exercised so strenuously through swimming or playing vigorous games such as handball, that profuse perspiration was induced and a condition of breathlessness created. And he was sure that he could not do this with exercises alone. That young man should try ten to fifteen repetitions in the deep knee bend with a heavy weight, or even the same number of dead weight lifts with a similar or heavier weight, or practice ten or more dead hang snatches. I consider this latter exercise the best exercise in the entire line of physical training because it brings all the muscles into play, employs all the muscle groups simultaneously and teaches them to coordinate and work in unison. It greatly amplifies or speeds up the action of all the internal processes, the organs and the glands which are stimulated by their proximity to the working muscles. It builds athletic ability, skill, speed, timing, nervous energy, endurance and strength. But most of all it induces perspiration, more rapid circulation and very deep breathing. You men who have tried repetition snatching will agree with me. Every lifter should run and every runner should lift. Healthwise this combination is tougher to beat than the American swimmers were in Tokyo. Since I was 14, I have run intermittently, one to three mornings a week. However, until Coach Igloi of the L.A. Track Team moved his runners from a nearby school to the playground where I run, and I became better acquainted with him, I had learned nothing about running. Coach defected from Hungary eight years ago. Until he came here American distance runners were as fast as a guy wearing an Oregon boot. Now they’re beating more foreign nations than we give aid to. Minus the refinements for each individual runner, the Igloi formula might be stated as follows: work and more work, sprint, slow up and sprint, shorten stride and take two steps in the time you were taking one. At present I have been training about five months under the Coach’s method. If my condition were any sharper more barbers would shave with me than an Oink Oink blade. Five mornings a week I sprint and trot eight miles. On Saturdays I trot past the 100 yard marker and sprint back. I do this 40 times each way. The coach thinks that by the end of 1965 I will have started to speed up. Until you have tried it a few weeks you may find it very hard to believe that you can speed up by shortening your stride. But remember, two steps will be sprouting where formerly only one took root. It won’t take you long to discover what an economical way it is to run. While in Mexico I have seen Indians carrying heavy loads shuffling along mile after mile. They not only endure, but make very good time. The shortened stride is almost like an extension of that shuffle. If you’re already running, change over to the Igloi method. You’ll be glad that you did. If you’re not running now, get with it. Start right in sprinting and trotting. That’s the only way to really sharpen up. Your sprints don’t have to be all-out until your legs can’t take it, but do change speeds. Coach Igloi says the changing of speeds is very easy on the heart. I can’t vouch for that because I’m not even aware that I have a heart, but I can assure you that it sharpens the wind. How often should you run? If you’re a mere youth of twenty to forty you might lift Mondays, and Thursdays run Tuesdays and Fridays and follow some sport or sports Saturdays and Sundays. If you’re 55, like Peary, you had better run four mornings a week. If you’re 67 like me, and one foot’s playing near the worm pit, make it no less than five a week. The older you get, and this you already know, the more you need workouts. You don’t need rest. You’ll soon have one longer than the time it takes for a combined lifting and posing meet. Of course, being planted might prove more exciting. Don’t confuse the running you do in a sport that you may follow with running itself. In any sport, running is intermittent. In running, the motion is continuous for a half hour, for an hour, or for an hour and a half. Forty years ago I was boxing, playing handball and baseball several days a week. My wind wasn’t near as sharp nor my legs as good then as they are today. But what will running do for your lifting or your so-called bodybuilding? Running distances as far as I do and running as often, I’m sure won’t do a thing for your lifting, but it won’t do anything TO it either. After fifteen months of six-days-a-week running, my press dropped 10 pounds below bodyweight after 12 months of no training on the press. I can make that up quicker than you can lose your bank roll in Vegas. But what if I couldn’t? What difference would that make? I’m just like 9,999 lifters out of 10,000. I never could lift! Russia is supposed to have hundreds of thousands of males lifting. Since there are no colleges subsidizing footballers, baseballers, basketballers and track men, no doubt she has. Yet how many top lifters in each division does she have? Very few. The reason? Not many are born to be champs but nearly everyone is born to have health. Lack of know-how, indifference, and wrong motivation are all that keep the majority from enjoying a vigorous youth, middle, and old age. What will running do for the pump-up gang? I think it’ll deflate them considerably and that’s all to the good. Grotesque exaggerations could probably become esthetic lines. Jealousy? I hear the pumpers and their followers cry. Their followers? Yes, they’re the guys who don’t even bother to pump up. Why should the older man run? Because he needs endurance more than strength, or money in the bank. Money, at best, can buy him specialists to keep him in a comatose stage a few weeks longer. Many hang around for many years without ever having been strong. But the moment anyone can no longer endure, his undertaker gets a windfall. Before you readers get the impression that I think all exercise freaks and monsters should be exterminated, let me explain my objection to them. I have known some very nice monsters. I have also known some very nice freaks. There are also some who are rotten stinkers. Lifting weights never put a halo on anyone. Taking food supplements never made anyone trustworthy. The semblance of power gives no one intrinsic worth. Isolating a muscle gives no one proper posture. One who deliberately adds 100 pounds of blubber just to lift a little more weight looks no better than the glutton. And both the exercise freaks and the overly pumped are keeping millions of intelligent youngsters from taking up weight training. Why? Because most of them want to look human. They want to follow a sport that will not deform them. I also have a personal gripe. Before the posers dominated the lifting contests I never missed one. Now I never attend. I still remember a Mr. America winner of some years back who conked out after he won his title. It happened after the show when he was posing for the photographers. The Miss America winners never pass out. They just break out in tears. In a past article I pointed out that it’s not only important to know which foods to eat, but that it’s equally important to know which foods to eliminate. I urged you to start in by eliminating potato chips. Now I’d like to go a step further on potatoes and ask you to eliminate them entirely if you eat in restaurants. But if you want to maintain a high degree of health, why are your eating in restaurants? Unless the restaurant is a very small one potatoes are no longer prepared in it. They are brought in from factories. Some french fries are even pan fried. All are prepared by machinery and preserved with chemicals. At least one manufacturer I know will not eat his own product. If you’re living on junk you’ll wind up on the junk heap no matter how much weight you push, how big your arms get, how wide your lats get, how thick your pecs grow or how many machines you wear out. For those more concerned with the semblance rather than the substance of health, should they take to the running fields, I must remind them of an unusual dividend for them. Their calves will grow. Mine are now about an inch bigger than nothing, their pre-running measurement. Except for the exhilarating feeling of being ALIVE, besides an increase in calf measurement, don’t look for another serendipity from running. For example, my arm now measures minus one. Holy Cow! That makes it 19” from nothing. Cold? Of course! When you see a man with a big, round, deep chest, what do you think? – that there’s a strong, superhealthy man, of course. Public opinion is quite correct in this belief, for a big chest provides more room for the organs which it encases. The lungs and heart have more “living space” – a larger chest box permits them to grow larger and stronger and makes it possible for them to do their work more efficiently. Few strength and health seekers realize the importance of a large rib box in helping them attain their cherished desire of greater strength and improved health, vigor, endurance, recuperative powers and longer life. Everyone should realize the importance of big, efficient lungs and a strong enduring heart. The heart starts beating before birth and the lungs commence their lifelong function of breathing an instant after the baby is born. For threescore and ten years, or, as the Bible informs us, “if by reason of strength, for fourscore years,” these two organs maintain life within the body. Briefly, it’s the work of the lungs to draw air into the body, extract the oxygen, impregnate the blood with it, which is then pumped or driven to every part of the body. Oxygen is necessary for life. It mixes with the blood fuel which in turn makes possible all bodily movements, pushing, lifting, pulling or carrying. On the return journeys the carbon dioxide is carried by the blood, extracted at the heart and expelled by the lungs. These two organs are partners in most important functions of the body. Although everyone knows that the lungs are important, they more fully realize the necessity of a strong heart in continuing to be useful and active and to remain in this world longer. When the lungs fail, it is never suddenly. Over a period of many years the little-used lungs will become weaker as a result of less bodily activity. The lungs are capable of extracting the oxygen from an estimated thirty times more air than is needed when completely inactive. As most persons spend their lives with as little physical activity as possible, the greater portion of their lungs is unused. In these deep, dark. moist recesses, germs can congregate, breed by the billions and cause consumption of tuberculosis. While there is less tuberculosis today than some years ago, every state has its sanitariums where people with weak lungs must go to spend months to get back to normalcy or perhaps be doomed to spend a lifetime (a shorter than normal life) with lung trouble. Less thought is given to the lungs than to the heart. When it fails through this gradual weakening process, or this slow insidious creeping of disease, it is less spectacular than the sudden heart stopping suffered by a friend or some other persons – a condition we know as heart failure. The heart will gradually weaken as a result of leading an inactive life; a competent physician’s diagnosis may disclose the fact that it is no longer functioning properly. But the majority who die of heart failure are not aware that their hearts are not working normally. Slight pains near the heart are usually attributed to indigestion or muscular aches. In our own country alone, more than a million people die of heart failure every year, for forty per cent of the total deaths result from a failure of this most important of organs. Hardly a day passes but we read of the sudden passing of some fairly youthful, well-known man. The very young seldom succumb to heart failure, but there is an increasing number who leave our good earth in that manner in their twenties, more in their thirties, with the forties and fifties being the most dangerous time. Heart failure causes men, in particular, to leave this world in their prime, just when they should be enjoying the results or their labors, and with their experience be so much more valuable to the nation through their vocation or profession. When one considers what a man has been able to accomplish in thirty of forty years, before his sudden death, how much more good would he have done in the world if he had lived longer – at least the normal span of threescore years and ten. He’s taken form the midst of his loving family and is no more. We must remember that no man can even exist, certainly not become strong and well developed, if he does not have a strong heart. “No man is stronger than his heart” is a good rule to remember. We hear so much of arteries that it’s easy enough to forget that the heart is the organ which must propel its life-containing properties to every cell and muscular fiber in the body. You have often heard it said that a man is as old or as young as his arteries. In advanced age arteries frequently stiffen, there is less flexibility, less expansion and smaller quantities of blood pass through them. The heart must work harder, and finally, after years of battling against these odds, it will give up, perhaps suddenly and spectacularly enough that a man makes the newspaper headlines in a way that he certainly has no wish to make them. You may be saying to yourself, “I know that a lot of people die of heart failure. Uncle so and so went that way and so did grandfather, but what can we do about it? One thing I can’t understand is why so many medical doctors, when they find some slight murmur in the heart of a patient, will warn him to cease all physical activity, to take things as easy as possible. He becomes afraid to bend or even to move for fear he’ll hurt his heart. The leaders of the American Medical Society, from their learned experience and study of many thousands of cases of heart ailments, inform us that exercise cannot, will not hurt the heart. By this I don’t mean that it would be wise to see how far you can swim under water, to see how fast you can run a mile when not in training, or to endeavor to run a twenty-six mile marathon, play thirty-six holes of golf or a full set of tennis if you are not in training. But the medical authorities as well as leading physical directors do teach that the heart is a muscular pump, a muscle, and like other muscles of the body it responds to exercise and becomes larger and stronger. It’s a common belief that athletes commonly die of athletic heart. Of the more than a million persons who die each year of heart ailments, some are certain to have been athletes. A man plays football, baseball, rows or goes out for track during the short years of his college career. Ever afterward he is considered to be an athlete. More than likely when he hangs up his spiked shoes, and concentrates on making a success of life, he feels that he is too busy to exercise. Like any other muscle, his heart will weaken somewhat through only ordinary use. If the muscles of the arms, legs, or torso are seldom used, never vigorously, they will become smaller, soft, flabby, weak and less enduring. As the heart is made up of similar muscular fibers it too will weaken with only normal use which is just a fraction of the work of which it is capable. Although it is known by the authorities in the medical and physical training world that the heart is only a muscular pump, that it is not possible to build up enough blood pressure even through the most intensive use to weaken it, there still are many who believe that the heart can be harmed through training. “as good as ever,” and he is the man whose life is often ended prematurely. In spite of neglect, misuse and abuse of his body he still believes that he is a superman. I have frequently written that there are two chief reasons for exercise. It makes you look and feel better. Many men take up the practice of physical training because they wish to build a handsome, admiration-creating figure. There are others, usually the younger fellows, whose sole purpose is to develop the greatest possible strength and the largest muscles which can be obtained. This is a worthy ambition, for since the dawn of history strength has been admired and literally worshipped by men and women alike. Life has always been a survival of the fittest. In this modern day, as in the past, the strongest win the better things of life. It takes these younger men a while to discover that there is a definite close relationship between strength and super-health. While the very young man doesn’t want to read about the organs, anatomy, correct eating or various phases of health – only wishes to learn how to develop his muscles, not realizing that it is not possible to develop strong, good-sized muscles without a knowledge and observance of the rules of correct eating, proper sleeping and the maintenance of a tranquil mind, the average man, usually the older man, will tell you that he doesn’t want big muscles. All he wants is health and physical fitness. Like the younger fellow who does not realize that he can’t have powerful, well-developed, shapely muscles without observing the laws of health, the man in the opposite category does not understand that he cannot have the health and physical fitness he desires, permanently, unless he has more than average strength. The average man in seeking health, too often, through the apparently easy ways of pills, medicines, and capsules, has not learned that obtaining strength and muscle is the best way to overcome the headaches, indigestion, constipation, colds and many other serious physical irregularities which annoy or even torture him. He may believe that these major and minor ills are a part of life. But the strong men do not experience them, nor do the animals in a wild state. They enjoy perfect health, and possess organs and internal functions which operate with super efficiency. If every man could realize in how many ways the possession of strength and the health that accompanies it affects our daily lives, even if our work is such that we need not employ strength, they would first investigate the best form of physical training, and then put into practice the proven facts that they have learned. Older men and women who wish to regain their youthful figures and youthful health and vigor should determine to spend a part of each week in physical activity, for physical activity will improve the action of all internal processes, greatly benefit health, how one feels, and promote longevity. The internal processes and organs are taught to function more efficiently through the demands made upon them by the muscles. Better-operating organs result in the building and storing up of greater reserves of vital energy. Strong internal organs – two of the most important of which are the heart and lungs, encased in the chest or rib box, to the strengthening and developing of which I am dedicating this book – are the result of proper care and exercise. To live in this good old world of ours longer and more fully you need good kidneys, a capable liver and digestive system and proper elimination. Your future well-being is controlled to a great extent by the capability of your stomach and allied organs, but at the head of the list in importance of your internal works we would find the heart and the lungs. If any of these parts do not perform their work properly, usually a most painful form of illness with ultimate premature death is sure to result. You depend upon these internal works and they depend upon you. You must take care of them so that they will take care of you. While nearly everyone knows that exercising the muscles will strengthen them they don’t know how to go about strengthening the organs. The organs can’t use dumbbells, barbells, or cables but they need exercise just the same. You are their partner; it’s up to you to strengthen them and to take care of them. Your physical success makes them stronger, more efficient and more successful, and your success even your life, depends upon how they perform for you. I believe you are coming to realize the importance of strong, efficient organs. You must believe that they need exercise and you know that they can’t take this exercise themselves. Baths, massage and proper feeding are also essentials and it’s your task – you who depend upon these organs – to provide the stimulation, the feeding and the exercise they require. Exercising the muscles is the only way to strengthen and beneficially affect the organs. You must know many men who enjoy perfect health; perhaps you enjoy perfect health yourself at the present. I hope you do. If you do, plan now to so organize your life that you will always enjoy more than normal, able-to-be-around health. If you are not quite well at present, plan to so regulate the activities of your life that you will build internal strength and efficiency. If you are one of the men who enjoy perfect health you have a strong heart, big lungs, perfect digestion and elimination; the strong heart and lungs, the perfect digestion, mean that all organs are well supplied with the materials they need to carry on their functions of building, maintenance and repair of all organs and cells. Your mode of living has been responsible for developing these strong internal functions. You not only want to keep them as they are, but plan to strengthen them and lengthen their life and usefulness, for this makes it possible for you to live much longer and more fully. You must have observed that the men with perfect health, perfect internal organs, are usually stronger than the average. Think of the strong men you have known. Aren’t they supermen; superhealthy too? It’s reasonable to believe that there is a close relationship between organic strength and muscular strength. You may wonder, are strong men strong because they have strong organs, or do they have strong organs because they are strong? Strong, sizeable muscles, the result of proper physical training, produce strong internal organs. Similar methods of exercise produce strong, powerful, sizeable, shapely muscles and strong organs. These exercises which build the size and shape of the muscles strengthen the internal organs. These exercises which build the size and shape of the muscles strengthen the internal organs. It can’t be seen but they are strengthened, improved and benefited just the same. While everyone knows that the voluntary muscles can be strengthened by causing the to exercise or work, few realize that an organic muscle such as the heart can be made more powerful through exercise. The growth and strength of the heart cannot be effected quite as easily as that of a voluntary muscle such as the biceps of the arm, but either the heart or lungs can be rapidly strengthened. You have often heard the expression, ‘Getting back into training.’ You know that prize fighters or wrestlers train more intensely before a contest. You know that the members of a football team spend some weeks training or preliminary conditioning before their season opens. In rowing if the first race is on Decoration Day, May 30th, the ambitious oarsmen have started to work out on the rowing machines sometime in February. Early in March they will take advantage of the first balmy breaths of spring on some fine day to have their first experience on the water. And from then on until the race the crewmen will train with ever-increasing severity until they are able to put forth great power over a four mile course and perhaps win the championship of America or the world. The average man goes out for football after some months of physical activity or at least only moderate exertion, unless he is smart enough to find that he should use graded apparatus such as barbells, dumbbells or cables to not only keep in condition but to better his physical state during the time of the year when he is not actively engaged in his favorite sport. And the football trainer knows that the men in his charge must start out gradually – pass the ball a bit, run a few times around the field, and not participate in more intensive practice for a time, such as “scrimmaging.” The preliminary training will wear off any fat which may have accumulated, but most important of all it will improve the action of and strengthen the heart and the lungs. A man can be quite strong, but he could not row four miles, run a mile race, or play a full sixty minutes of football unless he has done something particularly to strengthen the heart and the lungs; to improve his wind. You start out to condition yourself and you run around the track two times. It is hard enough to make these two round trips the first day. But within a week you have increased the distance to four times around and the first two are mere child’s play. Each day the work becomes easier, so that before long you can run a mile with strong, steady strides and with only deep breathing as a result of the continued activity. The strengthening of your heart and lung action has made this great difference. In physical training the man with weak muscles and the weak internal organs which accompany them will make his start with moderate resistance and few repetitions. He handles more and more weight as the muscles respond to this gradually progressive resistance. As the muscles are coaxed along, continually trained, as they increase in size, strength and efficiency, their partners, the organs, particularly the heart and lungs, improve likewise. Just as in running, you find yourself able to run a little farther each day, you become able to perform more exercises or handle more weight in the exercises through this bodily conditioning series of physical exercises or activity. You won’t see the improvement in your organs as you can see that in the muscles, but it takes place just the same. The added strength and endurance you obtain through various forms of athletics or physical training comes as a result of the work of the internal organs. The organs provide the fuel for the muscles, feed them and drive them. When you build greater strength and endurance you have actually built better functioning organs and glands. When you run a bit, if you are unaccustomed to it you will soon find your heart pounding and you will be breathing so forcefully that it actually hurts. The lungs will ache and burn afterward. You can feel that the muscular action has made demands upon the organs. The muscles are burning fuel very rapidly, and just as the gasoline in your motor car, or the oil burner in your cellar, requires great quantities of air with its all important oxygen, the working muscles, with the process of combustion which takes place in them, require many times the usual quantity of oxygen. When you become tired so tired or weak that you must stop, it’s because an oxygen debt has piled up. The muscles have been forced to operate without the necessary amount of oxygen. You must have experienced a condition of second wind. It takes place in long distance running. After running a mile or so, depending upon the condition and training of the athlete, he will feel tired, almost exhausted for a time. But after a while as he continues to run he will have more pep and energy, breathe without distress. A balance has taken place. The lungs and heart have caught up to the demands of the hard-working muscles; the oxygen debt has been overcome and physical activity goes on more smoothly. Training therefore has made possible better operating lungs and heart, and stronger heart and lungs. The special effort amplifies the heart and lung action, breathing is deeper, circulation is improved, worn and broken-down tissue is carried away and it is more rapidly replaced with additional fresh building material. The improved respiration benefits the blood stream, impregnates it with life=giving oxygen which unites with glycogen, providing combustion or power in the muscles. There are other favorable results of exercise which aid the organs in their work. Perspiration, which eliminates much waste from the body, is one of these. The continued exercise creates a rubbing, massaging effect which helps elimination, hastens digestion, improves assimilation. From this you can see that any form of physical activity has a beneficial effect upon the internal organs – chiefly the heart and lungs. And the more your muscles move, the harder they work the more work your internal organs have to do. In a later chapter you will read that one of the best chest-developing exercises is the deep-knee bend, and the explanation as to why this vigorous exercise, which brings into action the largest muscles of the body – those farthest from the heart and lungs – is one of the best to develop these important organs. And just as the muscles strengthen with the work progressively demanded of them, the organs strengthen too. The muscles are trained to run faster, jump farther, lift more weight, and this gradual improvement comes about because the heart and lungs are improving too. The strongest men have the strongest organs – particularly the strongest heart and lungs. The strongest lungs result from the increased, more intensive breathing. As the heart is a muscle it has been strengthened and generally benefited by the work demanded of it and of course the result of other organic action has caused it to be supplied with the materials it needs to build and strengthen itself. While this book is intended only to supply means for the care and development of the chest, I can’t refrain from reiterating once again that this tremendous strengthening of the organs if the reason for the fact that strong men live longer and retain their physical ability to a very advanced age. The pages of Strength and Health magazine have carried the stories of a legion of men well past the threescore and ten age who are splendid physical specimens – far stronger than much younger men who are inactive. It has been told before how John Y. Smith of Boston, at the age of sixty, weighting only one-hundred and sixty pounds outlifted men of larger size and all ages to win the title “Strongest Man In All New England.” He’s now seventy-five; his friend and training mate, Oscar Mathes, is seventy-seven. There are Warren Lincoln Travis, Prof. Wm. Hermann, Prof. Adolph Rhein, George Hackenschmidt, George Zottman, Joe Lambert, Arthur Dandurand and scores of others who are past sixty, seventy, eighty and even ninety, all former strong men, and so many others – all proof that building strength in the muscles is accompanied by strength in the internal organs. Strong men are strong all over; they have perfect-operating organs; aren’t troubled by even minor ills such as indigestion, belching, gas, heartburn, or other minor or major digestive and eliminative complaints; their organs, keeping pace with the increased efficiency of their muscles, synchronize and operate more efficiently when properly treated, which also means properly exercised. All of what I have written is meant to convince you that gradually progressive resistance, gradually increased physical endeavor of any sort, constantly increasing the strength of the muscles so that they can handle more weight, is the road to superorganic action which will in turn result in a longer, fuller and happier life. As I stated earlier in this chapter, there are some young men who are willing to exercise just for the improved appearance that muscles give them. But the vast majority exercise for the improved feelings which they have learned are the result of exercise. The majority would consider it the height of folly to exercise just to get these muscles on the outside of the body if it were not for the improved appearance, the superior feelings, the happier and longer life the developing of these muscles will produce. The true facts are that a man must have a perfectly operating heart, powerful lungs, a vigorous digestive system, and a good sound nervous system to enlarge the chest or build muscles on any other part of the body. Modern barbell and dumbbell training, as I teach it, produces the most amazing and beneficial effect on the organs of the body. Top Photo - Abe Goldberg. Bottom - A moon or Yogi bench. I believe there is more interest, among those who are seeking physical betterment, in the development of the chest than any other part of the body. Most experienced bodybuilders understand that the building of a larger chest means that the entire physique becomes larger and better developed. Bigger chests mean broader shoulders, more muscles on the outside of the chest, and larger limbs. While less thought is given to the important fact that a larger fib box means more room for the all-important heart and lungs, with an improvement in strength, health, and longevity, this should be the paramount reason for developing the chest. Regardless of the reason why bodybuilders want bigger chests – whether it is the realization that a bigger chest will mean greater strength, superior health, more vital power and endurance, additional resistance to disease, greater longevity, or whether it is the desire to look better through having a bigger chest – the fact does remain that every man who is seeking greater health, strength and development is interested in building the chest. I believe that a man with a large, roomy, deep chest excites admiration and commands attention even more universal than the man with broad shoulders or big arms. The vast majority of those who take up the practice of physical exercise do so to look better and to feel better. Although the big, well-developed chest is impressive in appearance and adds to the aspect of the physique when clothed or in athletic costume, the most important feature about big-chested men is the fact that they are always extremely healthy, which of course means that they not only feel well but like the proverbial million. I have at times written that I am a leading competitor for the title: “World’s Healthiest Man.” It’s impossible to be healthier than I. Few can be so completely free from the slightest pain or physical irregularity of any sort, have such unusual pep and energy, and more than their share of physical strength. I believe that my own good-sized chest has been responsible for much of the much of the wind, endurance and rapid recuperative powers I have always shown in athletics and after enforced periods of heavy work. As you go on reading the chapters of this book you should be impressed with the fact that a big chest provides room for good-sized, powerful, efficiently-operating internal organs of all sorts. The man with a big chest almost without exception is superhealthy, usually healthy in proportion to the size of his chest. There are exceptions to all rules, but the man with the biggest chest should be, and most often is, healthiest because of the size of his chest; while the man with just big arms or broad shoulders is not necessarily healthy on account of them, but usually is healthy because the exercises which made possible his development have built a big chest and unusual internal strength too. As we will consider farther on in the chapters on anatomy, the upper chest contains a large part, a highly important part, of the vital organs – the heart and the lungs, in particular; and in the lower part of the chest, the stomach, liver, kidneys and spleen, as well as many important glands. When a man possesses a large, roomy chest box, there is plenty of space for these organs to develop, to increase in size, with a simultaneous increase in internal strength and vigor. Some time ago I received a letter which I remember particularly from among the many thousands of other letters, for it illustrates how little some medical men know about physical development. Modern, well-informed doctors fully realize the beneficial development effect, strength of the body inside and out, which results from weight training. But there still are a few like the one reported in the letter under discussion. The writer of the letter was thirty-six years of age; he told me that he had been interested in weight training for about one year as a result of reading Strength and Health magazine, but before taking up this form of training – using “Iron Pills” – he considered it prudent to consult with his family physician as to the advisability of training with weights. Friend doctor told him not to use weights, that he was too old. He said that weight training would build larger muscles, and as the heart was a muscle it would grow, too; with the enforced breathing which resulted from intensive training, the lungs would strive to get bigger; but a man at his age could not increase the size of his chest as he was too old – past the stage when the skeletal framework could be altered in any manner. With larger organs congestion and serious ills would result. The man thought things over for a time; he saw the picture of myself illustrating the fact that my chest had grown fourteen inches since I reached a mature are, and he began to believe that he could follow the instructions in the York Courses, and probably augment the size of his rib box. He knew, too, that if he felt any sign of congestion in the thorax through the growth of his heart and lungs and failure of the rib box to increase in size, that he could moderate his training, or cease altogether. He wrote me a letter and asked if I thought he could increase the size of his chest at his present age. I cited my own case of continued growth when past the age of thirty. Most of my chest growth resulted since I found myself in a position to train more regularly ten years ago, when I was thirty-two. A man’s nose and ears grow until he is a hundred if he can live that long. The shoulders can be widened and the chest enlarged until the age of fifty at least. Even after that age, there is a good possibility of gaining larger chest measurements by increasing the development of the muscles which cover the chest on all sides. Bone itself seldom grows after the age of twenty. Some men have grown taller after twenty-one years of age, but they are the exception rather than the rule. There is some broadening of the shoulders through a readjustment of the bones, and a stretching and thickening of the attachments which hold the clavicle bones together. The breastbone itself will not grow, but bones of the ribs will spread through the lengthening of the cartilaginous attachments of the rib bones. I recently received a letter form this same man saying that I was exactly right, for in the first three months of regular training his chest increased in size from thirty-six to forty. In another chapter I will enumerate a few other cases of men who increased the size of their chests to a considerable extent after they had reached an age of maturity. Nature takes care of her children; if a demand is made upon the body, this demand will be met. If the activities of the body require larger hearts and bigger lungs a greater space will be made for them to occupy. Hundreds of cases are now history, which prove that the chest can be greatly enlarged when well past the age of normal maturity. If a man has a chest of only thirty-six inches, isn’t it logical to expect that he also has small organs, and isn’t it reasonable to believe that these organs have less chance to cope with various ills and any attack of disease upon their particular selves? It’s a rather homely comparison, but any farmer can look at a group of chicks a week or two old and point out those which will amount to anything. Those that have plenty of chest room and space in the section which corresponds to the lower chest will live and grow and pay their way. The chickens with the longer bodies are the ones which possess the quality of livability and have sufficient resistance to possible disease. Those which remain small and round will probably never grow up, and if they do, they will represent a loss either in weight gained or egg-laying ability. Or ask any man who knows mature chickens and can cull them. Those with smallest chests, with lack of development in the portion of their bodies which holds the organs encased in the lower chest of humans, are the first to be culled; for it is known that they have little chance to continue living – less to lay and pay their way. A well-developed chest box, which has been greatly enlarged and is in perfect condition, has a much better and surer chance of doing its work well, withstanding any sickness or ills, or to aid in recuperation from any ills which ma be contracted due to lack of condition in the remainder of the body. You are guaranteeing your future health, your strength and longevity by developing your chest. It provides room for the internal organs, strength to protect them, and of course adds to the appearance of its owner. It should interest the bodybuilder to know that the chest is the easiest part of the body to develop, as well as the most important. It can be increased in size more rapidly than any other part. It is not unusual for a gain of from ten to twelve inches to be registered in a year’s time b the young man who is going through or has just passed through the period of puberty or of rapid growth. Not so rapid gains are usually registered by men who are older but three to six inches in one year is quite usual. A considerable portion of this growth is the development of a larger fib box, but the muscles of the upper chest, the sides and the upper back account for quite a lot of it. When a man builds a really well-developed chest, he has little or no expansion because his chest is always near the limit of its possible enlargement. I am often asked how much chest expansion I have, and always report that I have almost none. If my interrogator apparently doubts this statement I go on to explain that if I would stand in the position of a soldier, with the chest erect, arms hanging naturally at the sides, thumbs along the seams of the trousers, I must get my shoulders back to the point where the chest is held almost at its limit even when not fully inflated with air. Try this yourself. If you already have a good chest, you won’t be able to expand much, if any, past the position of attention. Years ago, one heard a great deal of chest expansion. A man was not considered to be strong and well developed unless there was an expansion of five to ten inches – even more with those who had developed the chest expansion art to the limit. The men who had the greatest chest expansion art to the limit. The men who had the greatest chest expansion were never strong men. They were usually men who had performed no exercises except those of a chest expanding nature. If a chest was really covered with firm muscles it could not enlarge to such a great extent. And strange as it may seem, some of the men with greatest chest expansions were those who experienced at least a slightly tubercular condition. The lungs were not so efficient in their operation and thus a much greater area of lung surface was required to perform the normal, moderate work of the breathing apparatus in an inactive person. 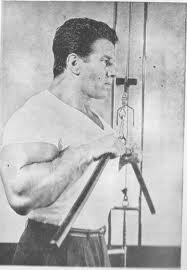 It has often been said that my friend, Otto Arco, great old time strongman, who is still one of the world’s most muscular men, one of the first three men in the world to lift double his bodyweight overhead, has no chest expansion. In two months of training, the regular training course and a bit of specialization in chest exercises, twenty-four hours of actual training time devoted to the regular, interested and intelligent practice of a few specialized chest-developing exercises, changes in one’ chest which are truly astounding will take place. Two months devoted to the development of any other part of the body, the arm, for instance, will bring results, but where the arm might be increased an inch in three months, four inches should be gained in the average case in increasing the chest measurement. This unusual rate of increase compared to that of any other part of the body comes about, primarily, because most of us – even those with the most sedentary occupations – use our arms and legs to at least some extent. They are better developed in comparison than is the chest. And the chest, being nearly three times as large as the arm in inches of circumference, naturally can gain more in inches to make the same proportionate gain. Three inches in chest gain is no more than one inch gain in arm or thigh. The body’s needs during enforced breathing as compared to the normal respiration of most of us. Even moderate exercise, increasing five or tenfold the operation of the lungs, will create demands which must be met by increased lung size and rib box capacity. Little permanent development of the chest will result merely from deep breathing alone, forcing much more air into the lungs than the body requires. Growth results rapidly when a demand has been made for more lung capacity, and that demand is made by deep breathing with moderate weights to aid the movement. The demands for more air are quickly and permanently met by increased lung size and rib box capacity. And when the bodybuilder becomes strong enough to work against very heavy resistance, to create an even greater demand for oxygen to meet the needs of the hard-working muscles, then really enforced breathing is necessary and the chest grows by leaps and bounds. The more muscles that are employed in the exercise, the harder and more continuous movement, the more oxygen is required. The deep knee bend is best known as a chest developer, for this movement brings into vigorous play the largest muscles of the body, those of the back as well as the legs, which include nearly half the muscular bulk of the body. Muscles farthest from the heart, powerful enough to vigorously and continuously exert themselves, require great quantities of oxygen to aid the working muscles and of course there is a commensurate gain in chest capacity. Compound exercises of a particularly vigorous nature, such as five movements in succession, each consisting of ten repetitions, exercises which involve all the muscles, such as deep knee bend, dead weight lift, rowing motion with the two hands curl and the two hands press to start the compound exercise, will make such demands that near the end of the fourth or fifth exercise, if substantial poundages have been employed, the bodybuilder should be breathing like he is near the completion of a mile race. When a breathing exercise such as the press on box or some form of the two arm pullover while lying follows such vigorous exertion, greatly increased chest size is sure to result. Top Photo - Paul Anderson at the Paul Anderson Youth Home. Middle - Bob Galluci squatting with a Magic Circle. Some time ago I wrote an article entitled "These Three Exercises Will Give You Fantastic Size and Power." Since I had received many letters and reports from trainees all over the world telling me how much they enjoyed the article and, more importantly, how much they gained in size and strength after trying the routine, I have decided to write up a few more such articles from time to time, so that you hard gainers will have a selection of routines to use whenever staleness or periods of no progress depress you into inactivity. 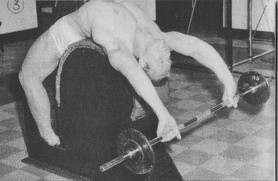 The theory behind working extremely hard on only two or three movements in order to overcome training staleness or to stimulate faster bodyweight, size and power gains is not new, for Peary Rader has been advising thin fellows and hard gainers to do just that for many, many years. But sometimes a younger fellow is hesitant to follow the advice of an older man when it comes to weight training, whereas, if another younger fellow offers him the SAME advice, he will unhesitatingly agree to give it a try, and it is for this reason that I am writing this article. It wasn't so long ago when my arms measured fifteen and a half inches and I had a chest which measured all of forty-four! I was as weak as a kitten and as massive as a hat rack and many people who know me then would not recognize me if they saw me now! For one thing thing, my chest is just under fifty-six and my arms just under twenty-one pumped and, while I freely admit I am carrying some lard as well as muscle, I still favor my present appearance to my former one! One of the first things I had to learn before I really began to gain was how to properly use my training energy without overtraining. Believe me, this can be very hard to finally come to grips with, because when you're young and ambitious and have plenty of free time, it is easy to fall into the trap of training all too frequently and much too much. This has probably happened to you and it most assuredly happened to me. One of the biggest mistakes an intermediate or beginning trainee can make is to try to emulate the workouts of the "champions." This type of intensive, gut-busting training bay be alright for Franco Columbu or Bill Kazmaier bit it is certain suicide for the fledging bodybuilder or size and power seeker. This kind of advanced work necessitates that you're in tip-top muscular shape to begin with from ten to fifteen years of agonizing hard work and sweat. This kind of work is for perfecting the almost perfect physique for competition with the world's finest strength athletes. It is not for any one who is just starting out, it is not for the underweight trainee and it is not for fellows like you or me! I have been training for around nine years and if I tried to follow a Mr. Universe's training routine for any length of time I'd fall flat on my face. And believe it or not, so would you. You must minimize the amount of training time and effort into intensive, short workouts on two or three basic movements in order to gain quickly in size and strength or you are going to shrink instead of grow. I train with a fellow who is really coming up fast in size and strength. His name is Steve and he's been training with us at the Elizabeth YMCA for about seven months now. Steve has an upper body that is out of this world. His deltoids and pectorals are massive, thick and loaded with striations. His back looks a yard wide and lumpy with muscle and his arms are finely shaped with high, thick biceps peak and massive horseshoe triceps. With a few months of thigh specialization he'd be good enough to enter in national competition. This is what I am presently trying to talk him into doing. And when he feels ready, I'd like to do a story on him. Steve trains six days a week with workouts which last three to four hours. He is one of the hardest workers I've ever seen in the gym and I've already told you about his great physique, but even though he gained training the way he does, this doesn't mean you or I could do the same thing. I have seen this fellow train his chest and shoulders with such ferocity it is enough to awe and inspire you, but in all honesty, I would not advise his routine to any of you. This is why I haven't listed it here for you to see. I'd be afraid some of you would try to copy it! I know such tales are stimulating and encourage you to train harder but as I said before, overtraining is suicide for the underweight man and severe training is only for th fellows with years of hard work and experience. In order to follow a champion's routine you must already be big, big enough so you can afford a few inches here or there in order to get into top muscular shape. Now do any of you fellows reading this feel you're big enough already??? The following workout is short, concise, and very hard. It is not for those of you who are afraid of hard work nor is it for those of you who like to pump up with light weights. It is a workout for a man and it will make QUITE a man out of anyone who cares to try it. It will not only build a fine looking physique but it will also bring, with the newly acquired muscles, much power. This routine can be followed three times per week. However, if after being on it a week or two you feel that it is too strenuous, then cut it down to twice weekly, but remember: Follow all movements as described and in the given order. Strive to handle the heaviest weights possible and finally, follow the advised diet. 1.) Full Squat: Begin with a weight comfortable for twelve repetitions. Now load the bar to a weight heavy enough for five, possibly six reps and perform three sets with this weight. For the next set, load the bar for a weight comfortable for eight reps and perform this last set for as many reps as possible. Rest as long as necessary between sets but try not to rest too long. About three minutes is right. 2.) Clean and Press: Power clean the weight for these presses and perform the press slowly and strictly and NOT in the Olympic manner. Begin with a warmup set of eight repetitions. Now jump the weight for six reps, then four reps, and finally two clean and presses with your heaviest weight. If you wish you can now drop down to a weight you can clean and press around ten times and this last set will really work your muscles, heart, internal organs and metabolism quite hard. Be sure to return the weight to the floor after each press and then clean it again for your next repetition. In this way, for every clean you do, you also press, and vice versa. Rest as long as necessary between each set but do not dawdle. 3.) Bent Arm Pullovers: This is the last movement in your mini-routine. The squats and clean and presses have worked the major muscles quite hard and tis last movement will the finishing touches on the routine. Primarily the chest, shoulders and upper back are worked hard with this movement and I am sure you fellows will enjoy the pump and muscle growth ache this movement will give you. Begin with a set of twelve for a warmup and then jump to two sets of four to six reps using the heaviest weight possible. For a final set, drop the weight so that at least eight reps are granted without undue effort. Be sure to breathe deeply between each repetition and be sure to perform each repetition slowly and strictly for best results. Rest as long as necessary between each set. All in all you have performed only fourteen sets during this entire workout. Yet you have worked up to heavy weights in three of the most severe and result producing movements you can find. This entire routine shouldn't take more than one and a half hour's work and this is really too long! It really shouldn't take more than an hour and fifteen minutes. Couple this routine with an one of the bulk gaining diets that are published regularly and get enough rest and sleep throughout the week and I'm positive you will gain greatly. Finally, if any of you want further information concerning such bulk training, feel free to write me at 145 Inslee Place, Elizabeth, New Jersey, 07206.